Once upon a time, there was a small but beautiful castle, tucked under a mountain outside the city. The castle had been in the William’s’ family for generations, and had a long history of splendor and opulence. Old Mr. Williams loved the castle and tended it carefully until he got too old to work. When old Mr. Williams passed away, the family donated the old castle to the state historic Society, as the family and the castle could trace their roots back to a famous person in history. The Director of the Society was excited to renovate the castle, and hired a contractor to restore it to its early grandeur. They had a limited budget for the renovation and realized that the renovation would have to take place over a long period of time, but The Society was very interested in opening at least part of the building to visitors as soon as possible. They conveyed this to the contractor. The contractor who successfully bid the project was called Bert, and he hired two subcontractors to supplement his own skills. The first subcontractor, Harry, was quiet and gruff, but a very competent builder. Harry had performed renovations on old buildings for many years, and was considered an expert on foundations and stability of old buildings. The second subcontractor, Franz, was effusive and charismatic – a decorator known throughout the community for his wonderfully creative works. Bert had worked with Franz many times before, and really enjoyed those times because Franz involved him in the decorating – Bert’s long-time avocation. The first order of business was to evaluate the castle. Harry checked and re-checked the foundation, the masonry, the interior walls, the ceilings and roof, and came to the first meeting with a detailed description of what needed to be done, how long it would take and how much it would cost. Meanwhile, Franz flitted through the castle with Bert, oohing and awing and generating all sorts of excitement about what the restored building could be. He didn’t have time to write down his ideas, and certainly he couldn’t put a price to his work yet – it was far too early. Because of Bert’s long history of working with Franz, he understood that the creative spirit couldn’t be dampened by details, and he told Bert that he just needed to keep him updated regularly, so that they didn’t go over budget. Bert told Harry and Franz that they should begin work the next day, and told Harry that the budget which the Society had provided was very limited, and that Harry would have to complete his work twenty percent under his original estimate. Harry was not happy about the budget cut, but he wasn’t the type to argue unless he had his facts straight. So he went back to his shop to ponder the dilemma. He changed the plan to use a lesser grade of materials, and he cut his own labor costs to a minimum. He decided that he would still be able to finish the work without compromising the safety and foundation of the building. Just to make sure that Bert knew how much effort he had put into the revision, and to make sure that Bert knew that he was sacrificing his own profit, he put the changes in writing and mailed a copy to Bert. He didn’t get a response from Bert, but he’d worked with Bert before and knew that Bert didn’t usually respond to mail. He was a little frustrated that he was having to revise his plan instead of beginning the renovation, but he’d been in business a long time, and he knew this was just part of the job. While Harry was busy revising his work plan, Franz was busy, busy, busy. He researched the furnishings and tapestries of the period, he talked to the Williams family and others about what they remembered about the castle, and he contacted antique dealers all over the world. He jetted to Europe to find a replica of the brocade settee that he found mentioned in old Williams’ family journals. He hired painters to paint the large foyer – he desperately wanted to begin work on this most impressive part of the castle. 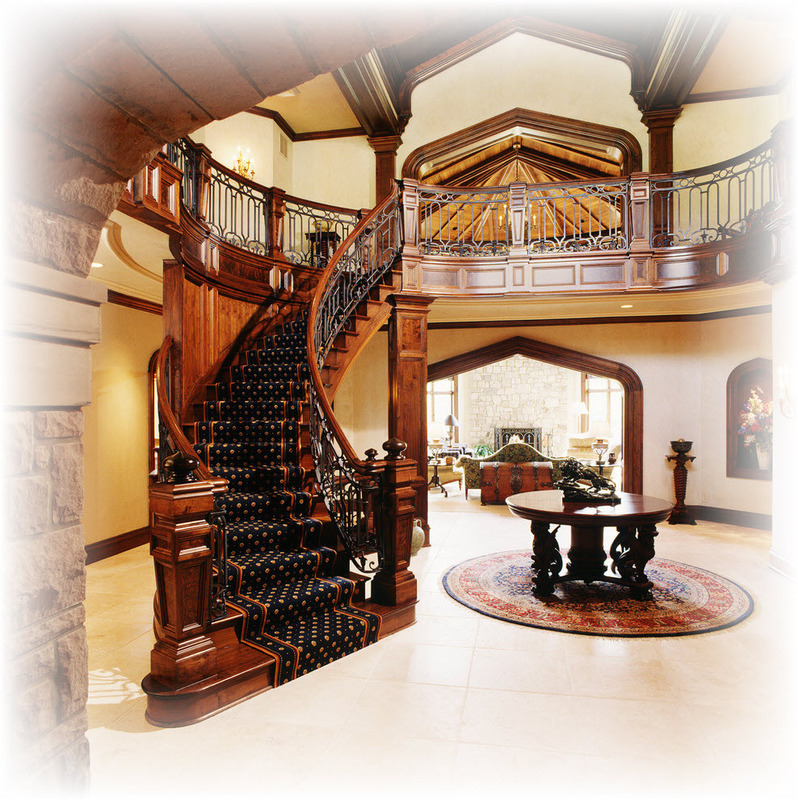 In the center of the foyer was a grand, curved staircase, with ornate wood carvings all along the banister. Franz could just picture the photo in Architectural Digest, with the caption reading….”by Franz”. At their next meeting, Bert asked Harry and Franz to report on how the renovation plans were progressing. Harry began by reminding Bert about the letter he had sent, with the revised materials list and cost. He began to itemize the specific compromises that he had made to the others; he felt that it was important that everyone understood that they were using lesser grade wood, and that the cracks in the foundation had to be fixed before any work could be started on the carpentry in the foyer. Bert interrupted Harry to ask if all of this information was in the letter he had sent. Harry replied that it was, and Bert suggested that he would go back and read it to save them all time. Bert then asked for Franz’ report. Franz had only returned from Europe a week before and was still soaring. He had found some of the most remarkable antiques, and had traced a perfect period lamp to a small antique shop in London, and had purchased it for “a steal”! Franz was so excited to talk about all the wonderful ideas he had, that he completely forgot to talk about his work plan. Bert suggested that they save that for the next meeting as they were running out of time. The last item on the agenda was the budget. Franz reported his expenses so far, and both Bert and Harry gasped. Franz had already spent 20% of the total budget! Bert quickly assessed the problem, and told Harry that he had to cut his building budget another 10%, or the whole renovation would go over budget. Harry started to argue, as he knew that he had already cut the budget to the least he could spend, and still maintain the building at code. After a few sentences, Harry decided he wasn’t effectively communicating his side of the story, and he decided to go back to his workshop and do some figuring. He didn’t feel very comfortable speaking his mind, especially when Bert and Franz seemed to work so effectively together – he sometimes felt like an outsider. Harry went back to his workshop and thought hard about how he could finish the renovation within the budget that Bert had given him. He talked with the lumber yard about discounts on the materials, and he thought about how he could do more of the work himself, in order to come in at the budget that Bert had given him. He took a moment to think about the fact that he regretted becoming involved in the project in the first place, because he knew that Bert was far more committed to the decorating part of the job, than to the building part of the job. The decorating was exciting and interesting; the building was just “bricks and mortar”. But Harry had accepted the job, so he knew that he must make the best of it. Harry’s friend at the lumber yard came through with a bigger discount because he had worked with Harry many times before and valued his continued patronage of the lumberyard. Harry decided that he could do the finish work on the grand staircase banister himself, since he was a master carpenter and could finish this work during the evenings. He managed to revise his budget one more time, to meet Bert’s expectation. He felt pretty good about having accomplished that, and went home to rest. Meanwhile, Franz continued his excursions, traveling and buying antiques and tapestries to restore the castle to it’s original beauty. He continued to see the foyer and the grand staircase as his first objective, and scheduled the painters to begin immediately after the plasterers finished the following week. He kept Bert up to date on patterns, and colors and designs. At the next meeting, Bert again asked Harry and Franz to report on their progress. Franz began this time, detailing the wall hanging for the dining hall, the crystal vase that would sit atop the antique rosewood table in the middle of the foyer and the antique crystal chandelier which would hang at over the vase. He described his friends in London who had located the crystal vase which, by the way, was a one-of-a-kind piece, and he went on and on about the difficulties he had getting the piece into the United States and through Customs. Then, It was Harry’s turn to report. He felt a bit awkward even before he gave his report. As he had listened to Franz’ progress report, he wondered if they didn’t have the proverbial cart before the horse. He thought Franz’ work was exquisite, but wondered how they could be thinking about the crystal vase for the foyer, and how they could think about the painting – and worse, how they could afford all of these elegant things – when they hadn’t begun to work on the foundation, which he knew had serious cracks that had to be repaired. But he was worried that if he stated this concern, he would be seen as too rigid or conservative. Harry felt pretty proud of himself. Speaking up was hard for him, but his argument was logical. Surely Bert and Franz would understand and adjust their budget and timing accordingly. Harry furrowed his brow and scratched his head. He wasn’t’ quite sure how the conversation turned so dramatically from his concern about the way that the team was approaching the work, to point the finger at him for not doing his job. But in Harry’s way, he didn’t want to cause an argument, and merely wanted to do the best job that he could do. Harry was just plain frustrated. He really believed that his part of the work – the foundation – was very, very important. But it just didn’t seem like Bert shared that opinion. He felt as if he had told Bert his concerns both in writing, and during the meetings. But it was as if Bert just didn’t want to listen. A week passed. Harry was able to begin work on the foundation, and began the very tedious task of patching the stone foundation, and sealing the areas under the castle. He enjoyed the solitude of his work, and knew that to do a thorough job would take time. The patches had to be applied one day, then the sealing had to be done the next. With such limited funds, he was doing much of the work himself. Late one afternoon when Harry was busy in the cellar underneath the foyer, he heard a loud commotion upstairs. He could hear Franz’ boisterous voice directing painters about the various colors they would use in that area. Harry was incredulous! How could Franz even think of beginning work upstairs when he hadn’t finished the work on the foundation of that part of the castle. The furnishings that Franz had purchased for the foyer were built of heavy, solid pieces of wood, and the foyer would surely get a great deal of traffic from visitors. He went upstairs to find Bert. Bert looked even more annoyed. He reminded Harry that the Society was interested in opening a small part of the castle for the holidays, and the he was being pushed by the Director of the Society to make sure he met the deadline. He told Harry again that he would find someone else to do the foundation work, if Harry wasn’t able to complete it in the allotted time. Harry was more discouraged than he could have imagined. He truly didn’t know what to do. He trusted his own judgment and experience, but the basic fact was that he wasn’t the boss. Bert was the boss. And Bert had been very specific about his priorities. If he didn’t need the money from the job, he would gladly tell Bert to get someone else to do this work. But he did need the job, so the only choice he had was to let Bert and Franz continue their work on the foyer, knowing that the crystal vase and antique rosewood table would be sitting on the floor above two stone columns which would bear a great load with the added furnishings and extra traffic. His initial examination of those two columns had shown that there were several deep cracks that would take almost three weeks to repair. He had detailed that in the last report he sent to Bert. So Harry decided that the only option he had was to do his work the best he was able, and pray that the added weight of the furnishings and the traffic caused by the painters would not weaken the columns before he was able to complete the work. Harry worked hard the next week. Even though he felt very abandoned by Bert, he still wanted to do the best job that he could do. He could hear the excitement above him, as Franz, Bert and the painters worked to beautify the walls of the foyer. He envied the nature of their jobs – that they could banter and talk as they worked. He did like working alone, and was at peace with it, but sometimes he missed the company. The following week, the painters were finishing the last of the trim. Only the most talented painters worked on the trim, so the others began the tedious work of cleaning up their equipment and carrying it back to the truck. While Franz and Bert were admiring the colorful walls, Franz suggested that they ask two of the painters to help carry in the antique rosewood table, so that they could see just how beautiful the foyer would be when it was complete. The four men huffed and panted as they move the very, very heavy table a few steps at a time. Franz and Bert stepped back to admire the table, but something was missing. Ah, the crystal vase that Franz had found in Europe – one-of-a-kind. He ran out to the back room, carefully picked up the vase and admired it, then walked gingerly back to the foyer and place the vase on the antique rosewood table. They stood back and looked. Truly, a masterpiece! They were so excited that they called to Harry under the flooring, and told him to come up and look at the new furnishings. Harry didn’t know what the call meant, but it sounded like he should see what was going on. So he wiped his hands on his trousers, and began the walk up the cellar stairs, and around to the front entranceway of the castle. As he walked up the three steps to the door, he heard a low rumbling, and it seemed as if the building was shaking. The weather was fine, so it wasn’t a thunderstorm he was hearing. He was suddenly scared, and trotted into the foyer. Harry arrived to stand behind Bert and Franz, just as the antique rosewood table with the crystal vase fell through the gaping hole in the foyer floor into the cellar below. The three men stared down into the hold. The crystal vase, which was one-of-a-kind, was shattered in a million pieces and the antique rosewood table was broken apart. The very items which they were so sure would impress the visitors to the castle for years to come were gone – destroyed. Harry sadly shook his head, turned on his heel and walked back out the door. Bert and Franz continued to stare into the hole, still not comprehending what had happened. The moral of the story…..don’t neglect a strong foundation just because the decorating is more fun. There are probably also a few lessons on leadership here. I wrote this years ago when my HR team was implementing a new technology system. I knew that our data was inaccurate because I had to deal with frustrated managers who told me so. My peer, in charge of the project, seemed to care only about bragging rights and having the “world class” technology system. It struck me then, and I have watched it play out for years, that organizations tend to minimize (and trivialize) the work needed to put a strong foundation which is typically hidden in the background, in favor of being able to tout a glossy new system that vendors said would “solve all of the problems.” Cracks in foundations aren’t always as dramatic as this, but over time, they damage credibility, if nothing else.